On October 19, 1864 as Confederate hopes in the Shenandoah Valley were dashed to pieces at Cedar Creek, across the Atlantic Ocean a quite different set of circumstances for the Confederacy were also taking place. These circumstances also involved a Shenandoah, but they came in the form of a ship, the Sea King, which off the coast of west Africa was commissioned and became the C.S.S. Shenandoah. With its commissioning, the Shenandoah became a raider, striking with quick precision at Federal vessels all over the World, ranging from as far as Cape Good Hope, to Melbourne, Australia and the Bering Sea. Operating well after the surrenders at Appomattox and Bennett Place, the Shenandoah became the last vestige of the defeated Confederacy—when its colors were struck at Liverpool, England the Confederate flag had been folded one last time. 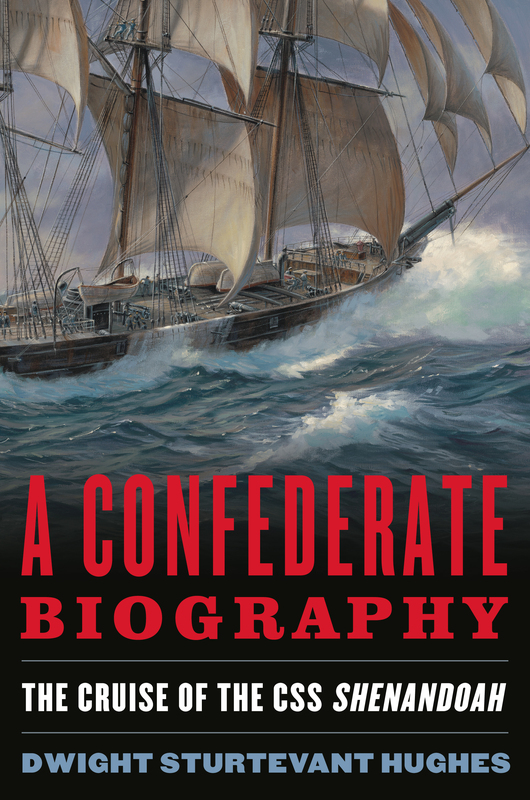 The Shenandoah’s dramatic voyage is most-recently profiled by Dwight S. Hughes in his A Confederate Biography: The Cruise of the CSS Shenandoah. Hughes’ work has been profiled here at ECW in the past, and this book is the culmination of his work. This is a book for both those who dream of a life at seas and those who grow green in the face with even the thought of an ocean’s breeze. For the latter, there are excellent cross-details of the ship so that they do not become lost in the jargon of 19th-century naval warfare. Hughes’ monograph on the Shenandoah fleshes out the ship’s crew, profiling the fact that it was a truly international conglomerate that brought the raider all across the globe. Here are also the officers of the Shenandoah, men who went to war for the Confederacy far from the battlefields traditionally thought of when thinking of the conflict that ranged from 1861-1865. Through Hughes’ strong quotation from their letters and diaries, one gets a strong look into the makeup of those who fought and lived aboard the Shenandoah, constantly on guard and toeing a fine line in international politics. Those politics saw the Shenandoah as a central figure between the United States and the United Kingdom in a spat that nearly led to war between the two powers. As the Shenandoah anchored at Melbourne, Australia and received repairs, the question became if Great Britain was culpable for any following damages to United States commerce, of which there was plenty. As such an entangling part of the Shenandoah’s story, Hughes spends plenty of time to bring his reader through the law of the respective parties without getting bogged down in the minute. With a voyage that lasted a little more than a year, the Shenandoah managed to capture over twenty prizes, burning most of them, all without the loss of a single battle casualty. The reader follows along with the United States’ Navy search for the Shenandoah as its warships patrol all over the World, looking for what at sometimes surely seemed to be a ghost ship. The U.S. Navy sought another climatic Alabama­-like confrontation where the renowned rebel raider was sunk off the coast of France, but the Shenandoah’s crew and officers proved too elusive, managing to evade their pursuers all the way back to Liverpool in November, 1865 after finally learning of the demoralizing news of the Confederacy’s fall. Hughes’ work is a solid effort into the Shenandoah’s famed voyage and his last point of the book certainly proves true: “The ship and men deserve to be remembered” (213). U.S. Naval Institute Press, 2015. 213 pages main/ 241 pages total. This entry was posted in Book Review, Books & Authors, Navies, Politics and tagged A Confederate Biography: The Cruise of the CSS Shenandoah, CSS Shenandoah, Dwight S. Hughes. Bookmark the permalink. It is a great book – and clearly a labor of love for Dwight.